During 2018, the Camarillo Police Department’s Special Enforcement Detail and Investigations Bureau seized 85 firearms and thousands of rounds of ammunition during the course of law enforcement related investigations. Throughout the year 2018, the Camarillo Police Department’s Special Enforcement Detail focused its attention on reducing the number of illegally possessed firearms available on the streets of Camarillo and targeting people who are not allowed to possess guns as a result of previous criminal convictions. Camarillo detectives conducted numerous investigations throughout the year involving the illegal possession of firearms and ammunition. As a direct result of these investigations, in 2018 the Camarillo Police Department seized 85 handguns and rifles and over 10,000 rounds of ammunition. Some of the firearms seized included assault rifles; a grenade launcher, WW1 and WW2 vintage high-powered rifles, high-capacity magazines and ammunition designed to pierce bullet-resistant vests. 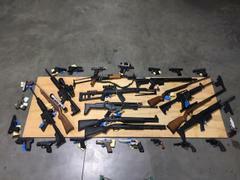 There were numerous arrests made as a result of these investigations and all the firearms seized are still being held as evidence or safekeeping by the Ventura County Sheriff’s Office. For 2019, the Camarillo Police Special Enforcement Detail and the Camarillo Investigations Bureau will continue to aggressively investigate all cases involving public safety and suspected illegal weapons / firearms possession. The Camarillo Police Department’s Special Enforcement Detail is a five person plain clothes detail that conducts a variety of investigations of crimes occurring within the City of Camarillo. The goal of SED is to reduce property crime and violent crime through investigations and directed enforcement. Anyone with information regarding illegal weapons possession is encouraged to contact the Camarillo Police Department at 805-388-5100.